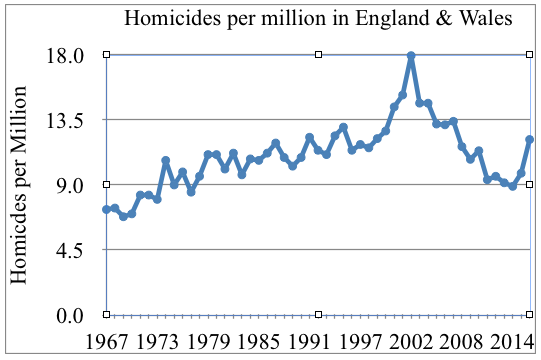 During debates about gun control, I have seen gun advocates quote a statistic that the UK homicide rate increased in 1996 following a ban on handguns. 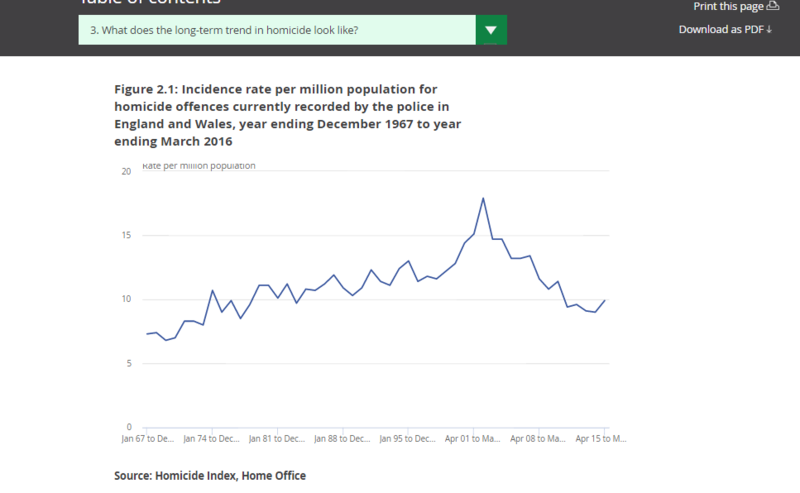 Furthermore, the claim usually goes on to suggest that what bought violent crime back down to current, historically low, levels was the introduction of 20,000 police. The inference we are supposed to draw from this is that the answer to gun crime is more police, not less guns. The UK enacted its handgun ban in 1996. From 1990 until the ban was enacted, the homicide rate fluctuated between 10.9 and 13 homicides per million. After the ban was enacted, homicides trended up until they reached a peak of 18.0 in 2003. 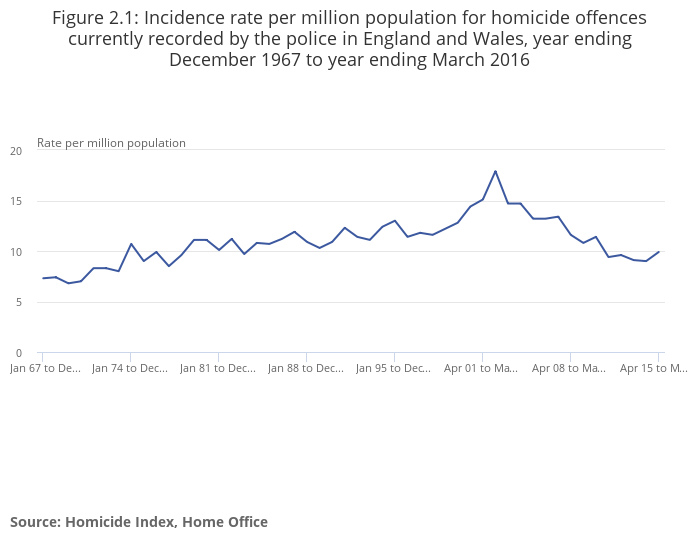 Since 2003, which incidentally was about the time the British government flooded the country with 20,000 more cops, the homicide rate has fallen to 11.1 in 2010. In other words, the 15-year experiment in a handgun ban has achieved absolutely nothing. That's from Mint Press News. There's another example at the Crime Prevention Research Center. When you dig into sites that present this argument, they all appear to be strong advocates against regulating firearms, which makes me suspicious. Is this statistic true? If it is accurate, on the surface, are there deeper conclusions we can draw from it? Correlation is not causality, and they ignore other factors on crime. This particular quote has cherry picked some data to support their argument, and ignored others. Let's look at their data claim again. From 1990 until the ban was enacted , the homicide rate fluctuated between 10.9 and 13 homicides per million. After the ban was enacted, homicides trended up until they reached a peak of 18.0 in 2003. 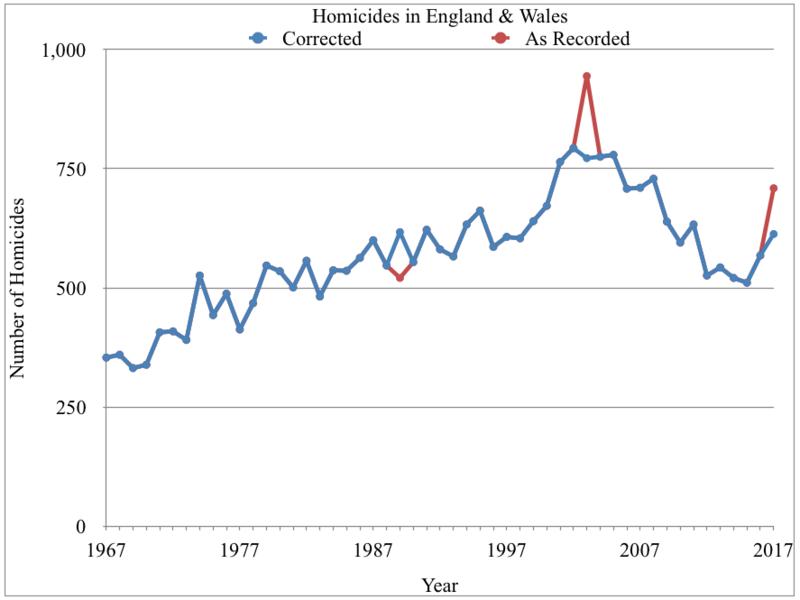 Very low UK homicide numbers are susceptible to how individual events are reported. The absolute rate of homicides in England and Wales (the data I'm using does not include Scotland) is so low, about 500 to 1000 persons per year, that individual events and how they're reported can throw off the trend. However, there are notes about anomalous events included in each year's numbers. Since the numbers are so low these can throw the graph off. In particular two large events which happened in previous years were reported for 2003 and 2017 respectively which accounts for their anomalous spikes. 2003 includes 172 victims of Dr Harold Shipman, one of the most prolific serial killers in history. While these killings happened over 25 years, they're recorded for 2003. 2017 includes 96 victims of Hillsborough which happened in 1989. The data notes other large, anomalous events are noted which can explain spikes in individual years. 2001 includes 58 Chinese nationals who suffocated in a lorry en route into the UK. 2004 includes 20 cockle pickers who drowned in Morecambe Bay. 2006 includes 52 victims of the 7 July London bombings. 2011 includes 12 victims of Derrick Bird. Once we remove the 171 deaths mis-attributed to 2003, the 2003 spike is replaced with a smooth plateau. Similarly once we move the 96 victims of Hillsborough from 2017 to 1989 where they belong, the 2017 uptick is diminished. The corrected data shows a smooth upward trend until a small spike in 2001, followed by a plateau for a few years, then a rapid fall off. There was a slow upward trend through 2000. Note that homicides are generally on a slow climb for decades. That trend continued smoothly, going past the 1997 handgun ban and all the way to a spike from 2001 to 2005 before falling off. The "spike" happened years after the ban. The whole process of confiscating virtually all legally held handguns took place between July 1997 and February 1998.
but there was no corresponding spike in 1998, 1999, nor 2000, those years follow the existing upward trend. (Note: I am not a statistician.) One way to determine if a given rise or fall is an anomaly, or simply part of a larger trend, is to look at a window of time and compare it to another window of time. If you take, say, 1990-2000 it doesn't look much different from 1980-1990 or 1970-1980, they all have their drops and climbs, they all follow the same basic trend; you can pass a ruler through it. Another way to look at it, 1977-1979 features an even larger rise than 1998-2000, but there's no corresponding gun control initiative to explain it. This indicates gun control wasn't the driving factor. The trend is definitely broken by 2001, 3-4 years after the ban. US and UK gun crime and ownership are very, very different. The conclusion the authors are pushing is that "gun control doesn't work in the US" and "guns reduce crime in the US", but they omit some key information which makes it difficult to draw such a conclusion using the UK as a template. 0.1% of the population turned in handguns. Fifty-seven thousand people were compelled to hand in 162,000 pistols, 700 tons of ammunition, propellants and related equipment. The population of England and Wales in 1997 was about 51 million. 0.1% of the population turned in handguns. One might question how confiscating so few legally owned guns had any impact on crime at all. That's exactly what Greenwood concludes. The situation is not, as some people have claimed, that the ban on handguns caused an increase in their use in crime. The truth is that it is a total irrelevance. Crime and the use of pistols has been increasing continuously over the period and everything that politicians and police have done has tended to exacerbate rather than tackle the problem, but the ban on handguns is neither here nor there in the equation. As a side note, it did not significantly reduce the number of legal gun owners in the UK. They just switched to carbines. The confiscation did not significantly reduce the number of active shooters. Most pistol clubs turned to shooting pistol-calibre carbines which are more powerful and have a larger magazines than most pistols. The total number of licence holders was reduced by only about 2,000. ~7% of UK homicides are with a gun, ~67% in the US. While in both countries about 3/4 of gun homicides are committed with handguns, there is an enormous difference in the ratio of gun vs non-gun homicides in general. According to the UNODC Homicides By Firearms, about 67% of homicides in the US are committed with a firearm vs about 7% (the number varies a bit) in the UK. Given this very, very large disparity in gun violence and ownership, one cannot draw conclusions about the effect of a similar handgun ban in the US. US homicide rates are 5x the UK, yet they have so many more guns. The US murder rate is the highest in the Western world at about 5 per 100,000 people, whereas the UK is at about 1 per 100,000, but the US has 16 times as many guns. If their argument is correct, if handgun ownership even at the minuscule 1997 UK level of 0.1% is supposed to be the most important negative factor in homicide rates (ie. more legal handguns means less homicides), then the US with 20-25% gun ownership should have a very low homicide rate. But this clearly is not true. This appears to be more-or-less correct. The spike in 2003 comes from a policy of recording homicides when discovered and not when committed, and a prolific long-term serial killer was apprehended then. There are other notes of spikes. The quoted article does not mention that suicides decreased, but they did. This was a continuation of an existing trend. I'd rate that as fairly accurate, in terms of numbers. The chart does indeed show a peak rate of 17.9 homicide incidents per 1,000,000 population for the year ending March, 2003. I'm not sure what deeper conclusions can be drawn. Both the availability of weapons and the likelihood of being prosecuted could have an effect on crime rates. I would mention that I don't know the political situation in the UK, or what would have caused such a change. It could be the handgun ban. Not the answer you're looking for? Browse other questions tagged united-states united-kingdom guns . Was a flamethrower used to incinerate Skripal's cat after its death?